You're not going to believe this, but I've finished something from my 2015 FAL Q2 list! OK, so it was the smallest item on the list, but it's done so it counts.My original post is here. This trivet is about 17" square. I started with a mixer block. 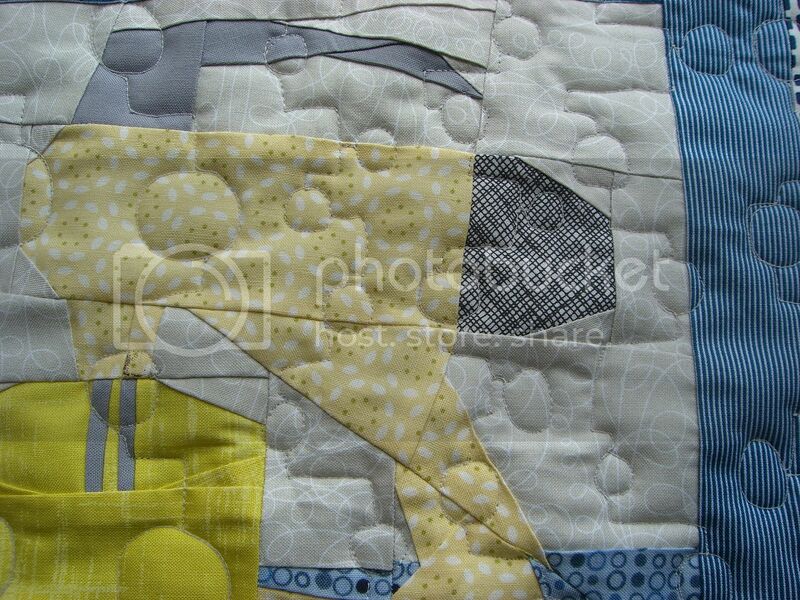 This is a paper pieced block and was designed by Kristy from Quiet Play for her Sew Kitschy BOM last year. I framed it with a round of blue fabric and a round of navy fabric. Instead of quilting and binding, I sewed it right sides together, with a piece of Insulbrite inside, then turned through. That's when I realised the Insulbrite was now on the outside, so I unpicked it and tried again. Then I quilted it. I wanted to practice the design I'm going to use on my Cuzco quilt which is Day 123 Angles and Circles from 365 Free Motion Quilting Designs by Leah Day, Mr CA bought me the book for our anniversary and I love it. There are no instructions included, but they're not generally needed and if I do need them, I can find the video on her website. The circles and angles to the right were too small, they were fine on this trivet, but would be much too small on the quilt and this was a practice piece, so I increased them. Much better. I then went on the quilt 4 columns of this design on Cuzco, I'll have to get some pictures to show you. It's backed in this funky toaster print. I love this print and it's perfect for my kitchen. Woohoo you've started quilting Cuzco!! 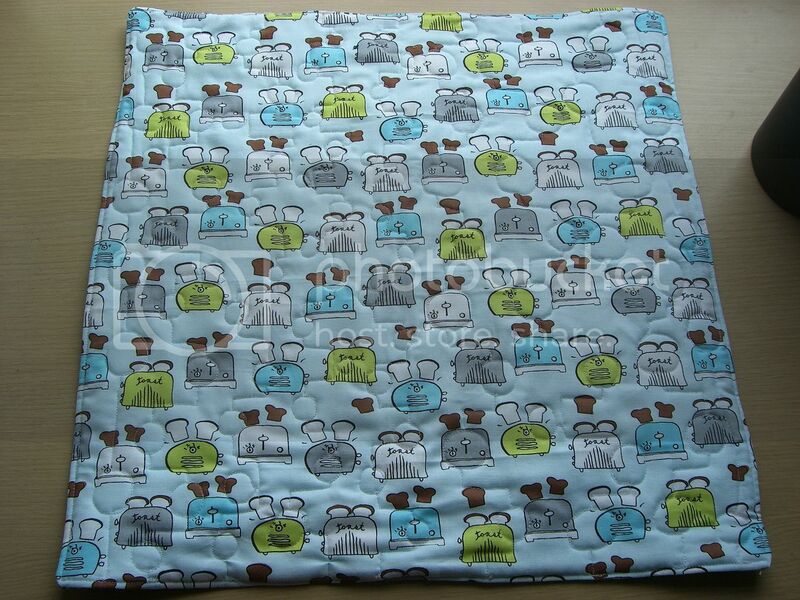 Cute little quilt and no doubt it will look perfect in your (new) kitchen. everything about this trivet is adorable ~ the mixer!!! the bubbles! the toast fabric!!!!! Very cute- and those toasters are adorable! Cute trivet - that toaster print on the back would make the most adorable curtains! That's a very cute print! Well done on your finish and well done for fmqing it, it looks great. Yay well done! It looks great! Love that print on the back. 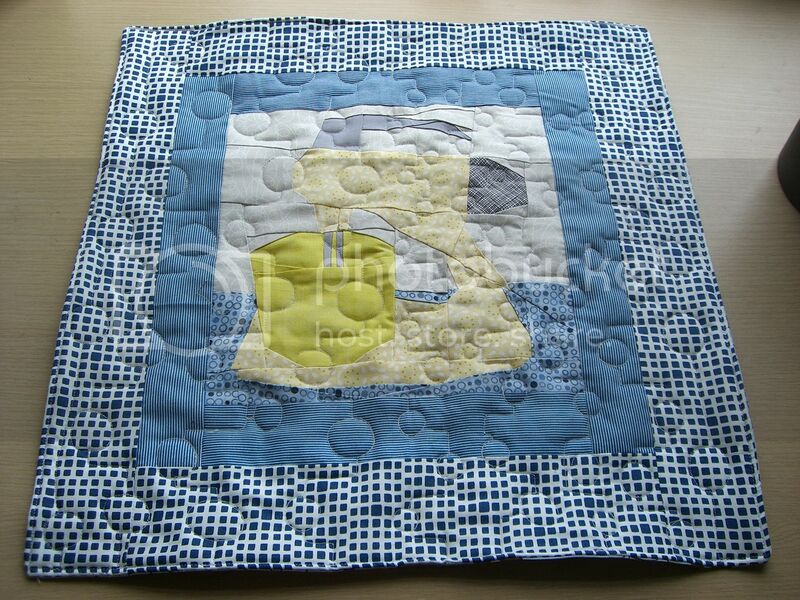 Love the bubble quilting and you did great piecing the mixer. I have that pattern but haven't tried it yet, and still haven't attempted FMQ. But you did great! And I love that toaster fabric. Do you know what line it came from? What a cute trivet! I love the angels and circles fmqing! And that backing fabric is just perfect. That is gorgeous! You are very talented! I love the mixer block! Another lovely finish, good for you! I'm visiting as member of the official 2015 Finish Along Cheerleading Squad.